Since the world’s first super-black building opened at the PyeongChang Winter Olympics 2018 Opening Ceremony on 9 February 2018, it has been a much talked about experience for those privileged enough to have stepped inside it. 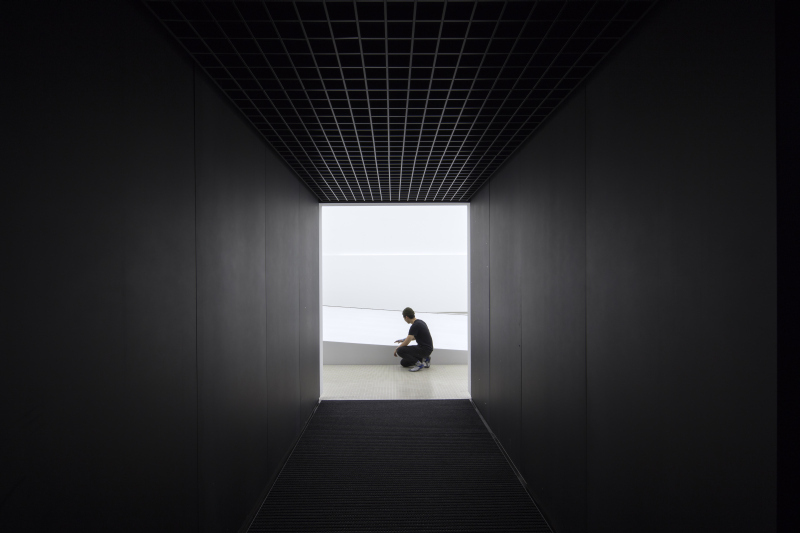 Designed by London-based architecture practice, Asif Khan, the building is entirely coated with a super-black material, Vantablack VBx2, making it the world’s largest continuous nanostructure. The matt Vantablack VBx super-black coatings respond extraordinarily to all types of light, delivering a unique user experience by reducing reflected light to a level where the viewer’s perception of 3D space is challenged from every viewing angle. Through the use of applied chemistry and nanotechnology, the spray application method creates a coating with a very low density, similar to a coral reef when seen under a microscope. The open nanostructure allows a far higher percentage of light arriving on the surface to be absorbed, typically 99% of light in the visible spectrum. This creates the illusion of a startling black void in broad daylight. The facades of the pavilion are punctuated by thousands of tiny white lights which, during the day, simulate the view into space from that point on earth. It illuminates the exterior like a field of stars that appear to float in mid-air. Inside the 35m x 35m structure, Khan has designed a vast “water room”, a multi-sensory hydrophobic water installation which emits 25 000 singular water droplets every minute. Visitor interaction with a series of haptic sensors creates new rhythms as droplets continually collide, join, and split across the water landscape, which appears like a city viewed from space. These flows of individual droplets collect, grow and build into a “lake”, which drains and reappears in the space of minutes. The “water room” is brightly lit and allows visitors to interact with a series of haptic sensors that creates rhythms as droplets continually collide, join, and split across the water landscape. Asif Khan commented: “From a distance the structure has the appearance of a window looking into the depths of outer space. As you approach it, this impression grows to fill your entire field of view. So on entering the building, it feels as though you are being absorbed into a cloud of blackness. “The water installation visitors discover inside is brightly lit in white. As your eyes adjust, you feel for a moment that the tiny water drops are at the scale of the stars. A water droplet is a size every visitor is familiar with. In the project I wanted to move from the scale of the cosmos to the scale of water droplets in a few steps. The droplets contain the same hydrogen from the beginning of the universe as the stars,” he explains. Hyundai Motor has commissioned the pavilion as part of a global mobility initiative. With its pioneering technology for the world’s first hydrogen fuel cell vehicle, Hyundai envisions a future society where mobility is both sustainable and accessible. The black façade of the pavilion represents the universe – the origin of hydrogen – and the interactive water droplets inside the building are inspired by individual hydrogen molecules and the technology behind Hyundai’s new hydrogen fuel cell vehicle. Asif Khan has worked with the client to encapsulate its vision for the future of motoring through architecture, design and visitor experience. The pavilion will remain open to the public until 18 March 2018. Full thanks and acknowledgement are given to Asif Khan and Purple for the information given to write this article. 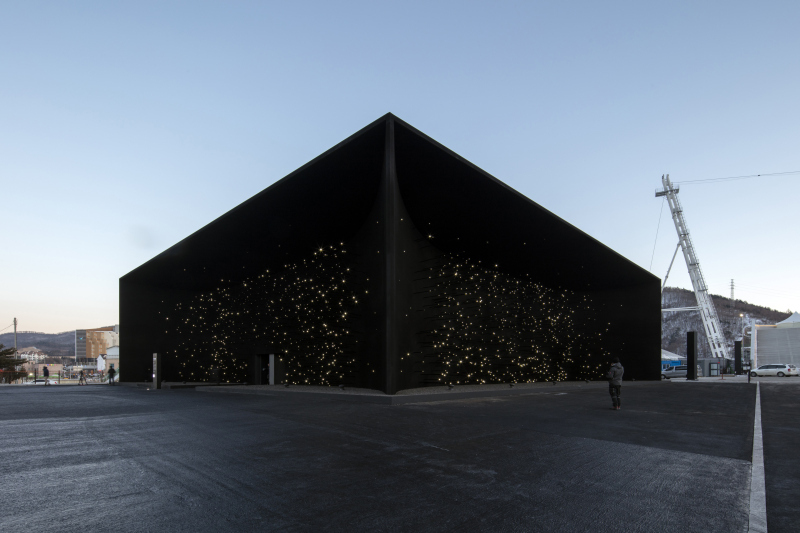 Hyundai Pavilion designed by Asif Khan at PyeongChang Winter Olympics 2018.The building is entirely coated with a super-black material, Vantablack VBx2, making it the world’s largest continuous nanostructure.